"Good tour that covered some nice sights in Egypt. CEO did a great job coordinating..."
"The tour was great. We saw some amazing sites. An experience of a lifetime!" "Great taster of ancient egypt"
"This trip was amazing - it had just the right amount of historical sightseeings and..."
"What an absolutely excellent trip! 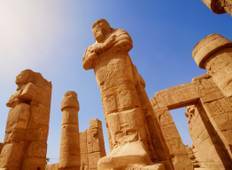 Medhat was such a great, knowledgeable and chilled..."
"Egypt was everything I expected and more. My friend and I went on Egypt Nile Jewel-..."
"What an amazing adventure. The organisation was superb from beginning to end. We..."
"Everything was really planned and the guides ayman and Mohammed were great super..."
"Fantastic tour! Would do it again"
"The tour of the temples, tombs and pyramids of Egypt was good, but what made the..."
"This was a fast-paced, well-planned, superbly guided tour of all the highlights of..."
"Ahmed was an amazing guide, very genuine, great at explaining history and he went..."